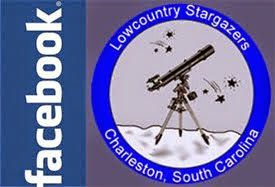 Weather permitting., the Lowcountry Stargazers are hosting a public observing night at their dark sky site. Observe the moon, constellations and deep-sky objects at one of the darker sites in the Charleston area, guided by members of the Lowcountry Stargazers. Bring a flashlight; red cellophane will be provided to cover the lens. Weather permitting. Saturday, April 21st from 7:45-9:45pm at Johns Island County Park, AKA Mullet Hall Equestrian Center, 2662 Mullet Hall Rd, Johns Island, SC 29455. Drive past the main entrance to the trailhead entrance, and park near the fence at the far end of the field. As always, these events are weather permitting so check back for any updates.